In 1946 the Red Hunters became the first models to feature Ariel’s new telescopic front fork, and the following year could be ordered with the optional Anstey Link plunger rear suspension. A new duplex loop frame with swinging-arm rear suspension and integral sidecar lugs was adopted for 1954 and the 500cc VH gained an alloy ‘head at the same time (a feature the 350cc NH would not enjoy until the 1956 range was announced). 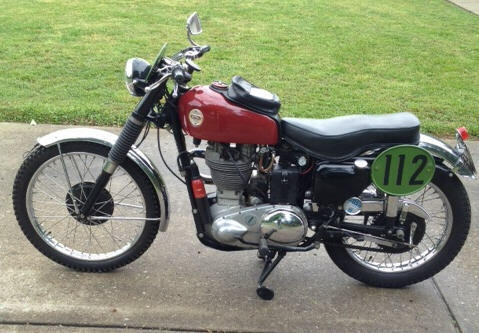 This machine was originally registered in 1955 as a 500cc Redhunter VH combination in the Ramsbottom, Lancashire area. 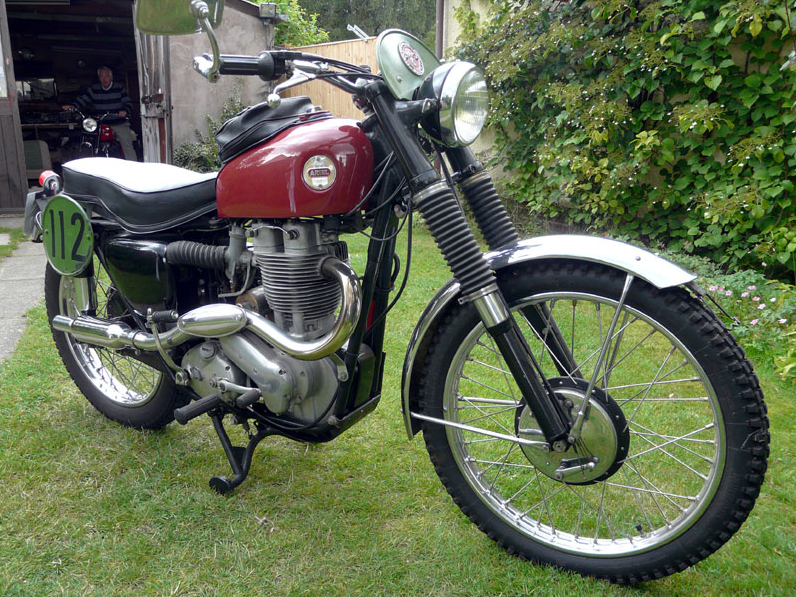 It subsequently passed to another Lancashire owner before being registered to James Sandiford Motorcycles Ltd in May 1959. 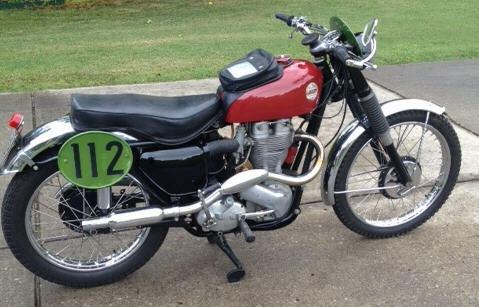 It is believed to be at this point in the machines history that the motorcycle was fitted with a number of HS scrambler specification parts, presumably for use as a clubmans trials outfit. It was sold by Sandifords to a local client, remaining in the Lancashire area until the early 1960’s when was registered in Essex. 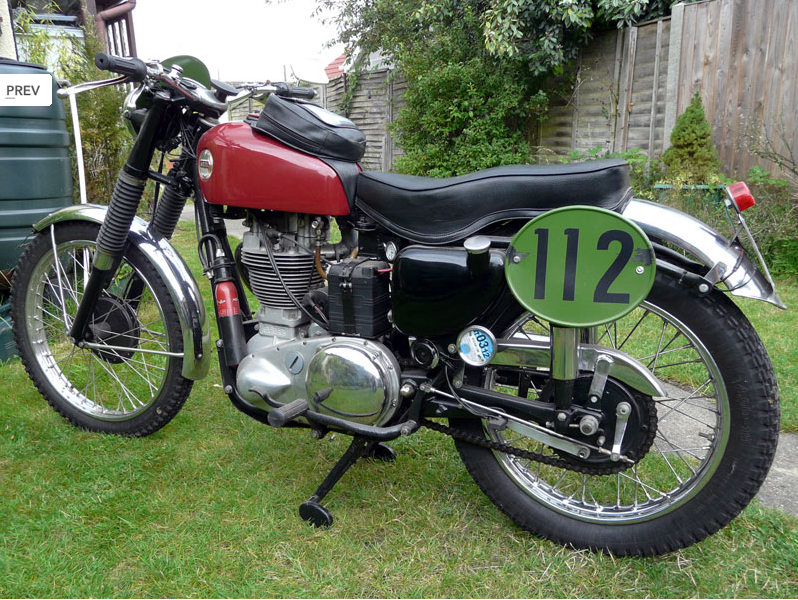 The vendor has subsequently been told that the machine was last used competitively as a scrambler by Dave Bickers by former Greeves factory rider Dave Bickers. The machine is now presented in full ISDT trim having recently been restored. The all alloy engine has been reconditioned as has the transmission and the frame has been powder coated. The red fuel tank and other painted items have been resprayed to a high standard and the cycle parts have been overhauled and renewed. The machine is fitted with a number of ISDT specific accessories including a compressed air bottle and a small front headlight. Presented to a very high standard throughout it is offered with a Swansea V5C, an MOT certificate valid until the 23rd March 2012, a road fund licence that expires on the 31st March 2012 together with the original buff log book.